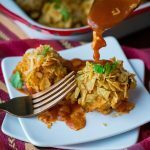 Crunchy Chicken Enchilada Meatballs - What the Forks for Dinner? Crunchy Chicken Enchilada Meatballs - What the Forks for Dinner? In a large bowl combine the first 8 ingredients using the 3/4 cup corn chips for meat mixture. Mix well. Form the mixture into 1 1/2 inch balls. you should get about 20-24. Using a small ice cream scoop will help keep a uniform size. Set up a dipping station; pour the remaining enchilada sauce into a shallow bowl and place the remaining corn chips in another shallow bowl. Dip each meatball into the enchilada sauce then roll to coat in the corn chips. Place meatballs in a cookie sheet sprayed with non-stick cooking spray or line the sheet with parchment paper. Bake in preheated oven for 20-25 minutes, until golden brown and cooked through. Pour any sauce left over from dipping on the bottom of a baking dish. Make sure the dish is large enough so the meatballs are in a single layer. Place cooked meatball on top of the sauce. Top with cheese dividing equally over meatballs and bake in same 400* oven for 10-15 minutes until the sauce is hot and bubbly and the cheese is starting to brown.